Humanoid robots are currently an active research platform. Since they have a human-like body plan they can act in environments designed for humans. Humanoid robots are able to, e.g., climb stairs, walk through cluttered environments, and open doors. In this block course, the students will implement algorithms for perception, state estimation, environment representation, navigation, and motion planning techniques on real humanoid robots. The students will work in small groups in our lab. All interested students should attend the Introductory Meeting. In the Introductory Meeting, we will present the topics, the schedule, the registration process, and answer your questions. After the first lab meeting, the participants can arrange their working schedule individually after consulting with their supervisor. 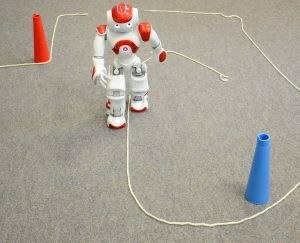 In this project, the robot's task is to follow a path marked on the floor. The robot should evade obstacles and be able to bridge short gaps in the path. The path is marked by a yarn. Obstacle and yarn detection should be implemented using a Convolutional Neural Network. 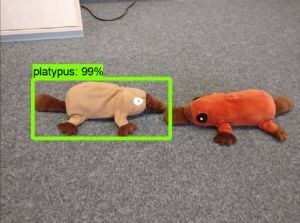 The goal of this project is to detect a specific toy among a small group of given toys based on user input. The detection should be done using a Convolutional Neural Network and augmented training data. 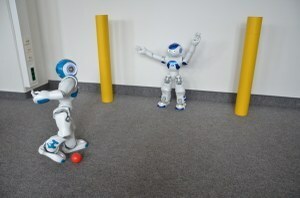 Once the toy is detected the robot should move to it, grab it and return it to the user. We place a red ball on a soccer field in front of a goal consisting of two yellow goal posts. The robot has to detect the goal and the ball with its built-in camera, walk to the ball in the right angle, and kick the ball into the goal. 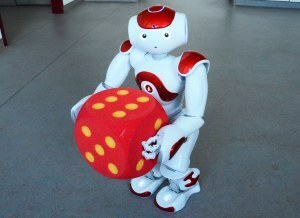 The goal of this project is to create a dice game that a Nao robot can play against a human, for example "21" (blackjack with dice), "Snakes and Ladders", "Mensch ärgere dich nicht", or a similar game. The robot has to roll a large foam dice, read the points on the dice, play the game according to the rules, and interact with the human opponent.